The Wall Street Journal published an article explaining how the pharmaceutical industry data mines credit card records, Internet traffic patterns, and other personal data on individuals, then forms educated guesses about the diseases those people might have. Locating actual people with specific diseases is valuable for companies that recruit patients into clinical trials, and also for drug companies trying to sell products via Direct-To-Consumer advertising. What if there were a much better way to not only know exactly the diseases a person has, but also what diseases they are likely to develop? There is, and it is found in one’s human genome, or their DNA. The Holy Grail for marketing companies and the healthcare industry would be to know the DNA of people. Of course, that information is strictly confidential and it would be illegal to snoop and collect DNA from people, unless people are tricked into giving it away with contractual consent. 23andMe, a small company that sells genetic screening kits based on saliva samples, recently got into trouble for illegally marketing genetic screening tests that were not validated and approved by the FDA. The company has since stopped marketing the tests. A few news reports did mention that 23andMe is a Google-backed genetic testing company, run by the ex-wife of Google Founder Sergey Brin. But Google has far more ambitious plans than just 23andMe. Google has funded and backed more than 10 healthcare companies, all of which have in common as business models some way to collect genetic and disease data from millions of people. 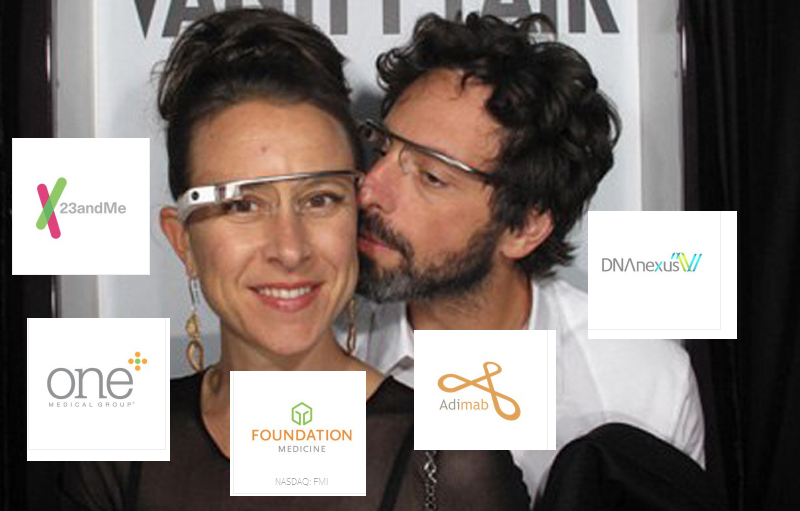 A Google webpage lists 11 companies: 23andMe, One Medical Group, Foundation Medicine, Adimab, DNAnexus, Flatiron Health, iPierian, Predilytics, Rani Therapeutics, SynapDx, and Transcriptic. All of the goals of the companies listed above are noble and very well could revolutionize primary care, oncology, and other areas of medicine. The problem is that Google is a private company that earns its revenue by selling data collected from users to Madison Avenue marketers. At the end of the day, all of those Android phones, self-driving cars, military robots, YouTube videos, and search engines, provided for free by Google, just collect valuable data on the users’ patterns and demographics, then Google sells it. Google public relations teams could argue that there is nothing to worry about. The 11 healthcare companies listed above are just financed by Google and not actually part of Google. However, Google could fully acquire any of them at any time and gain complete access to the DNA and other healthcare metadata harvested. Even more disturbing than collecting DNA as a business model is the One Medical Group, which helps streamline the primary care doctor appointment scheduling process. Far more telling than knowing one’s DNA is their actual medical record with details of doctor visits. “One Medical” seems to bypass HIPAA laws, and collects the users’ actual medical records in a round about way, by asking the user to list the reason for the doctor office visit (Warning, once the hyperlink to One Medical is clicked, the browser will not let the user leave the site unless cookies are removed). A user signs an online contract with “One Medical”. Another Google-backed company, Predilytics, goes beyond the individual doctor office and targets entire medical centers and physician practice groups. Using the Trojan Horse of providing a “patented analytic tools to transform healthcare “big data”, and to point the way for at-risk healthcare organizations to optimize and precisely target their care delivery resources, to increase revenue, and to control costs.”, Predilytics becomes intertwined in the medical records of the healthcare organization. Even the government’s own NSA does not have this power. In a previous similar attempt, Google Health wanted to collect and manage electronic health records. After three years, Google cancelled the project in 2011. Marissa Mayer ran the program before leaving to become the Yahoo CEO. Is it legal for Google to collect DNA information on millions of people using weak contracts agreed to by a click of a mouse? The law is old and not designed to address modern technology. Law enforcement can collect DNA at a crime scene, but the constitution and Fourth Amendment restrict when DNA can be collected and used against defendants in criminal cases. Governing the insurance industry and private sector employers preventing abuse of DNA information is a 2008 Federal law. People cannot be turned down for insurance based on a genetic finding, and employers cannot fire or hire based on genetic data. The newer ACA (Obamacare) law also prevents preexisting conditions from being used to refuse coverage. However, all recourse to the law is lost if one signs away their rights by agreeing to a contract with Google, for example. Whether online “contracts” are enforceable is a new realm of contract law being decided in the courts. As one young billionaire after the other is created in Silicon Valley, many of whom have no college degree, the huge egos and delusions of grandeur blossom. Mark Zuckerberg wants to overhaul immigration and education policies. Bill Gates is trying to cure disease in Africa, and the Winklevii want to replace sovereign nation currency (and avoid taxes) with their Bitcoin. Possibly more powerful than all of those grand maniacal schemes would be to control the health of the billions of people on earth. No company has a bigger collective ego than Google, and that is what it plans to do by collecting the DNA of everyone foolish enough to voluntarily give it away. This entry was posted in - Opinion, - Policy, FDA, Genetics. Bookmark the permalink.